Peaches from the hills are the best thing Delhi gets in summers. 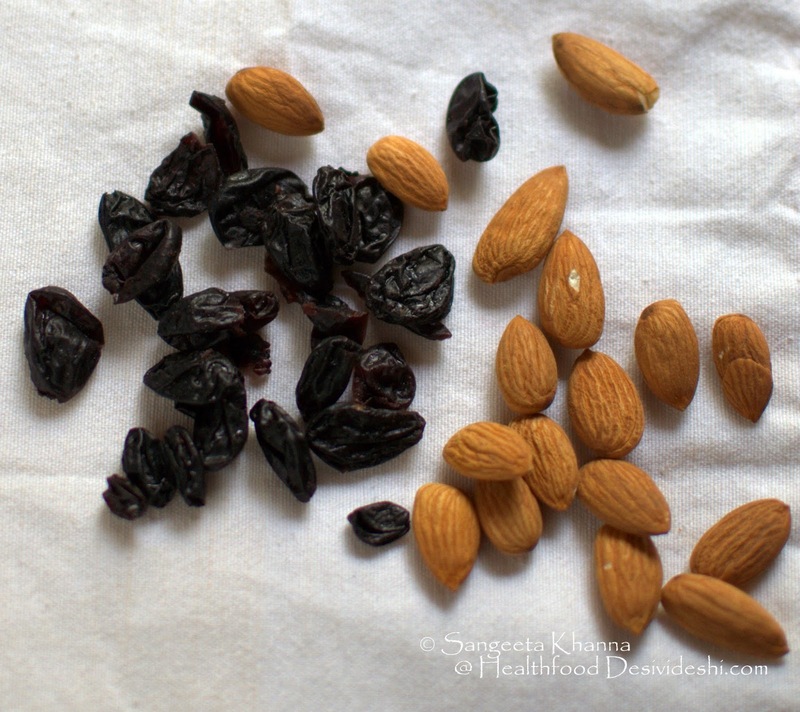 Add plums, Apricots, Cherries and green almonds to the list too. And yes, add the occasional rains and cold breeze that comes from the hills so close by. They say Delhi has no climate of it's own and gets affected by everything that happens in the foothills and even higher mountains of Himalayas. When there is a snowfall there, Delhi starts getting colder. Not that it is happening anytime sooner, but talking about colder climate gives some relief from the blazing sun that we are experiencing these days. Thank God I work from home. So we are enjoying litchis and mangoes from the plains and stone fruits from the hills sitting here in Delhi. The many benefits of living in a capital city. When we go to the hills we don't see any mangoes and litchi and when we go to the plains we don't see any stone fruits. 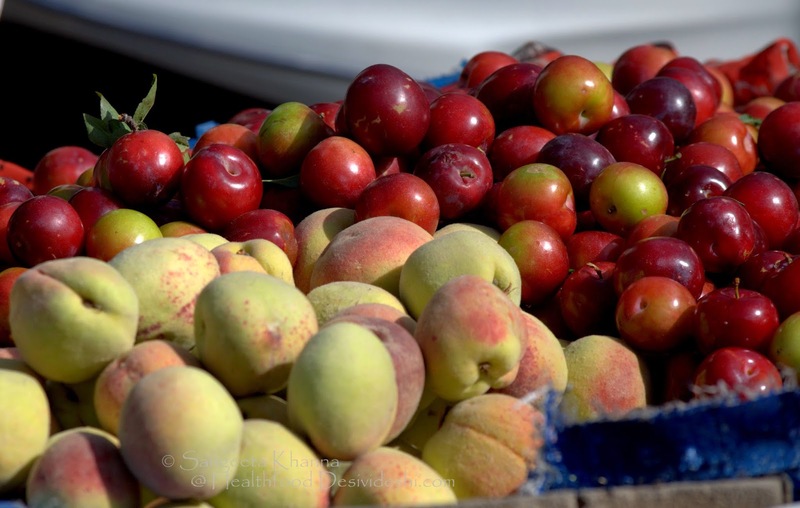 Folks eat more local fruits in smaller towns, more tasty fruits, mostly plucked ripe and juicy though the variety of fruits is lesser. But life is better in many other ways. Think a life without traffic snarls and smog infested air. 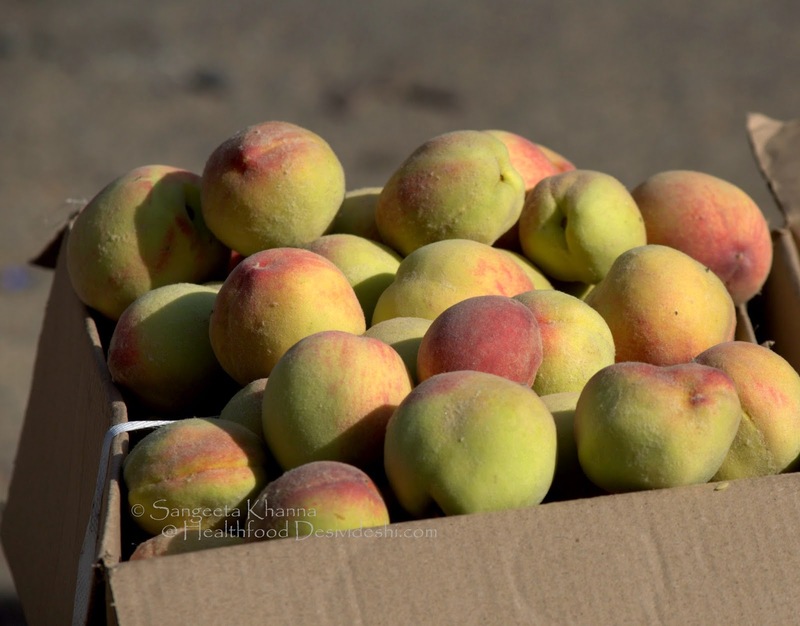 In my last visit to Te Aroha, I saw freshly plucked peaches, plums and Apricots being sold on the roadside without weighing them. You get bagfuls of juicy fresh fruits for pittance. I made plum jam with red wine and everyone loved it. Going to make it again and have decided to bring a huge carton of plums next time. Most of the times we buy peaches that are quite hard and crisp. While I like fresh crisp peaches too, but can't seem to have a lot of them at a time. And also because we are just two people and I tend to buy more than we can finish normally, the fruits almost always get tested for it's shelf life in the several differently sized fruit baskets that I have. And through this experience I learnt that a few fruits taste better when they get slightly shriveled. Peaches are one of them. And the seeds also detach easily from the flesh when the peaches get a little shriveled. So I chop them and make salads because this is the only way we can consume more fruit and make it a meal. 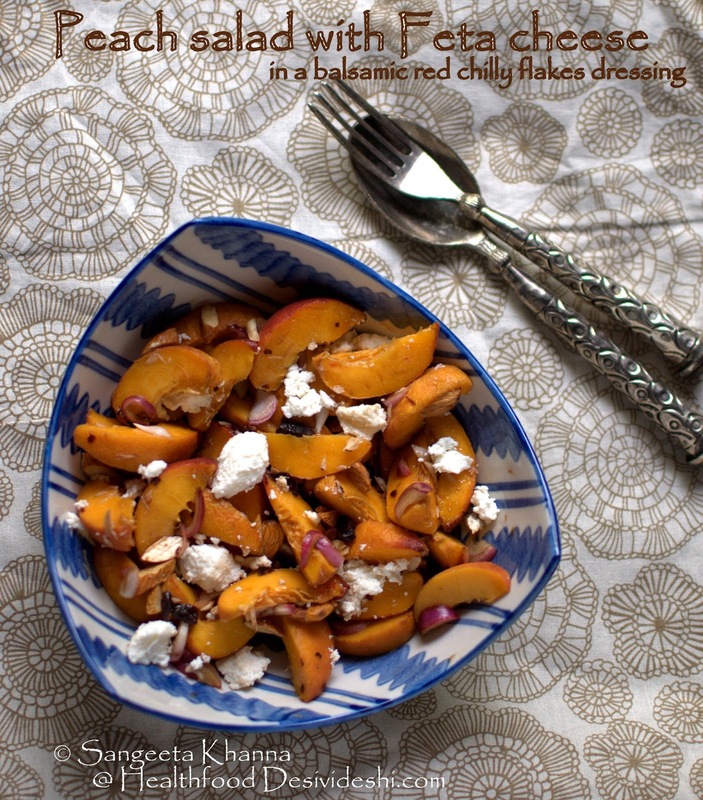 See the peach and mint salad I posted 4 years ago and make every season with minimal fuss. A pasta with peaches is also a favourite and we both love it. 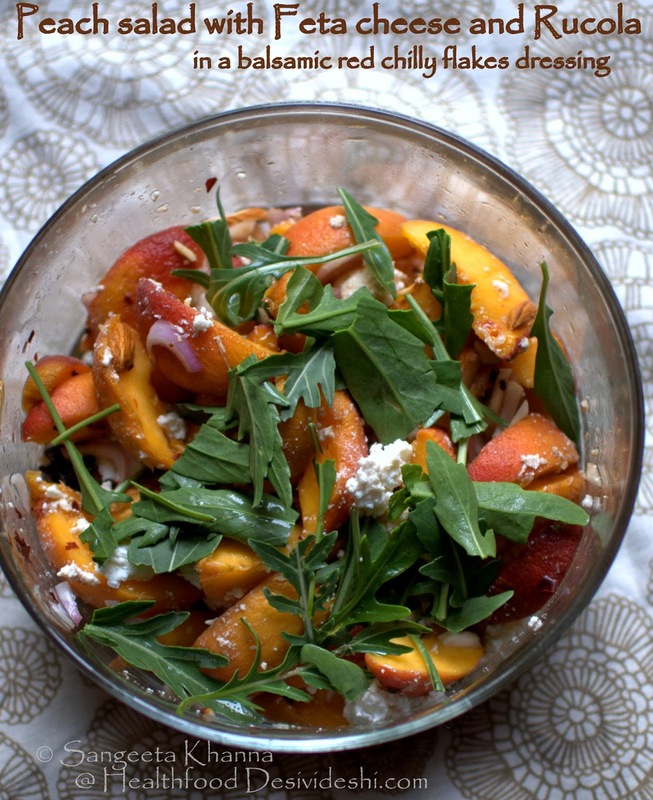 This peaches and rucola salad with home made feta cheese is a favourite and I throw in a few cubes of mangoes too sometimes. But mostly it is only the peaches and rucola from the garden. 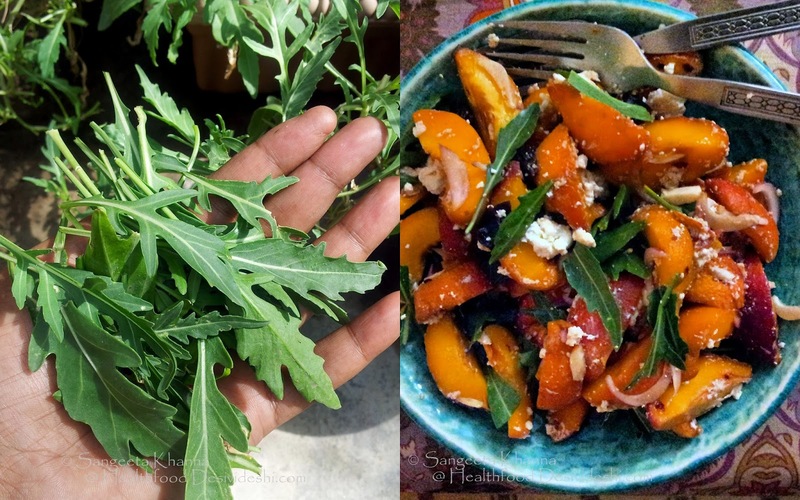 Thankfully, it is only rucola that is doing pretty well in this scorching heat, all other salad greens are long gone and the herbs are somehow surviving, not looking their best with a few leaves blotched in all the pots. To make the dressing, mix the balsamic vinegar with salt and chilly flakes. Add the sliced onions and mix well. Pour this dressing over the peach wedges and toss well to mix. Add the other ingredients and mix well, adding feta in bits in the very lastso they don't get too crumbled when mixed. Let the salad soak for about 20 minutes or serve after a good soaking of 3-4 hours. The salad keeps well in the fridge for a day if the rucola is not added. Add rucola in the end, toss and serve. Don't worry if you don;t have rucola, the salad tastes great even without it. All the textures and flavours are interesting and combine really well with each other. The roasted chilly flakes add a mild kick in between and the subtle sweetness of fruit with balsamic vinegar is something you would get addicted to. Home made feta is way better than any feta in the markets here, make at home or get any brand you like. Any other cheese wont be good for this salad. Apart from this peach salad with feta cheese, dehydrated grapes and almonds in a balsamic red chilly flakes dressing, which is a little complex recipe if you don't get all the ingredients in your part of the world, this peach and mint salad and the pasta with peaches might interest you if you love peaches the way I do and want simpler ecipes. Check them out and try them. And please let me know if you like. I am so glad you love these ..
Sangeetha i want know how to make feta cheese at home. Sangeetha do you the procedure to make home made feta cheese on your blog?? Not yet Varunavi. I will post the recipe of Feta cheese very soon.